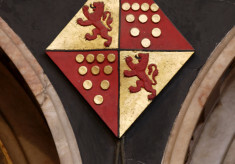 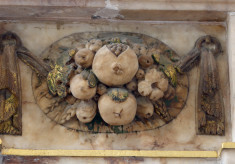 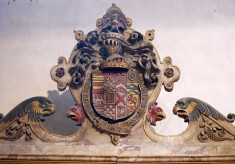 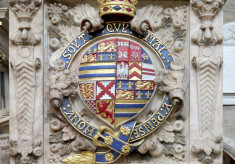 The shield of John, 2nd Earl of Rutland, as displayed in the panel mounted on his tomb in St Mary's. 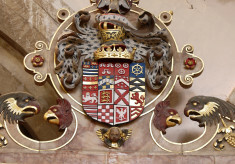 The shield is enclosed within the belt of the Order of the Garter and surmounted by a baronial crown. 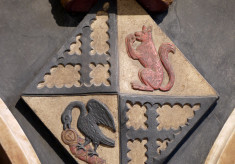 Manners 16th Century to the present day. 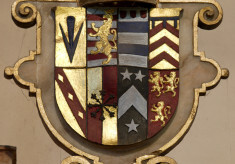 One of the most interesting images on display is the St Ledger Coat of Arms. 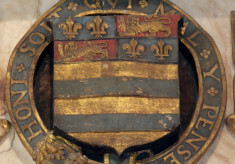 Anne Plantagenet, sister of Edward IV, Richard III, George Duke of Clarence and Edmund Earl of Rutland, married as her second husband Sir Thomas St Ledger. Their daughter, Anne St Ledger, married Sir George Manners, Lord Roos, and their son Thomas Manners was created the 1st Earl of Rutland (Second Creation) by his second cousin Henry VIII. 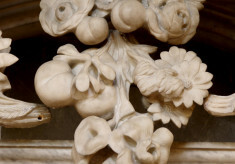 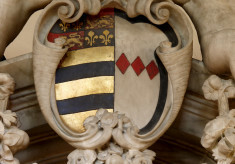 The present family name at Belvoir is still Manners and has been so for over 500 years. 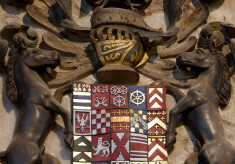 Despite our investigations, some of the emblems remain unidentified, and we invite visitors to contribute information where applicable. 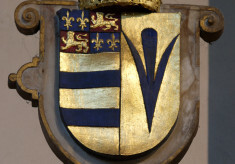 The shield of Margaret Neville, 2nd Countess of Rutland. 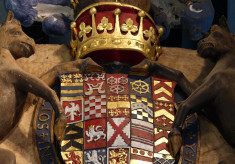 Joint heraldic shield of Edward, 3rd Earl, and Isabel, 3rd Countess of Rutland. 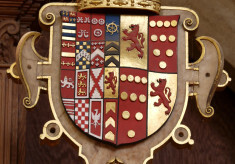 This shield displays the armorial blazons of Edward Manners, 3rd Earl of Rutland, and Isabel (Holcroft), Countess. 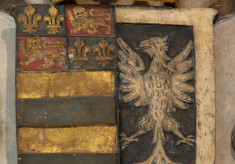 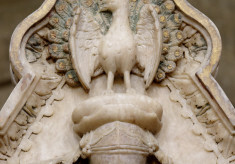 This second shield is virtually identical with her other shield on the tomb of her and the 3rd Earl. 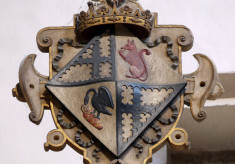 Countess Elizabeth outlived her husband, and it was she who built the Rutland Hospital in Bottesford (1591). 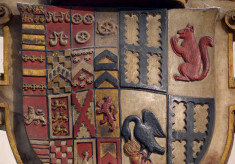 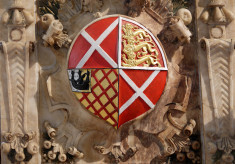 In this simple shield, the arms of the Manners, Earls of Rutland, are seen with those of the Sidneys. 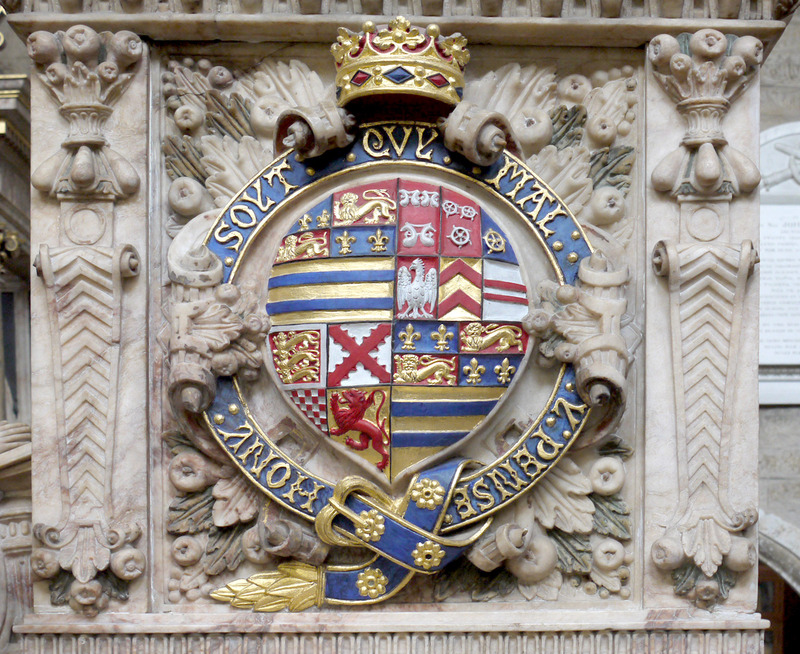 Item: The shield of Margaret Neville, 2nd Countess of Rutland. 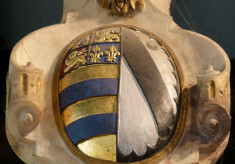 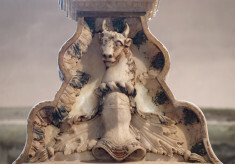 Item: Joint heraldic shield of Edward, 3rd Earl, and Isabel, 3rd Countess of Rutland.